He was one of country music’s biggest stars of the ’50s and ’60s, in total writing over 1,000 songs and scoring well over 100 hit singles. I can’t think of anyone apart from Elvis who has had such an influence and hold on musical culture for over 40 years, the singer became an imposing and influential figure. Johnny Cash didn't sound like county music from Nashville, nor did he sound like a rock & roll singer. He created his own subgenre, halfway between folk, rock & roll, and the world-weariness of country. Born in the town of Kingsland, Cleveland County, Arkansas, to Ray Cash, a farmer, and Carrie Rivers Cash, who at the height of the Depression, took advantage of a new farming program, an experiment in American Socialism created by Roosevelt's new administration. With no money down, the Cash family was given 20 acres of fertile bottom land and a five-room house in Dyess Colony, in the northeast part of the state. At the age of 12 Cash began writing his own songs inspired by the country songs he heard on the radio. He graduated from high school in 1950, moving to Detroit to work in an auto factory and then with the outbreak of the Korean War, he enlisted in the Air Force. While he was in the Air Force, Cash bought his first guitar and taught himself to play. When Elvis Presley's debut single was released on Sam Phillips' Sun Records, Cash eager to get into music moved to Memphis, taking a job at the local Chevrolet dealership, near Sun Studios on Union Avenue. It was while working here, Cash was introduced to Luther Monroe Perkins and Marshall Grant who were guitar pickers who, with steel guitarist A.W. 'Red' Kernodle had the group The Tennessee Three. Cash started to rehearse gospel songs with them and soon found themselves playing at local parties and church socials - all dressed in black. This was 1957 and Cash also made his Grand Ole Opry debut that year, again appearing all in black where the other performers were decked out in flamboyant, rhinestone-studded outfits. Eventually, he earned the nickname of "The Man in Black." As his career was taking off in the late 1950s, Cash started drinking heavily and became addicted to amphetamines and barbiturates. Cash used the uppers to stay awake during tours. Friends joked about his "nervousness" and erratic behavior, many ignoring the warning signs of his worsening drug addiction. His signature songs include "I Walk The Line", "Folsom Prison Blues", "Ring Of Fire", and "Man in Black". He also recorded humorous numbers, including "One Piece At A Time" and "A Boy Named Sue"; a duet with his future wife, June Carter, called "Jackson", (which won them a Grammy award), as well as railroad songs including "Hey, Porter" and "Rock Island Line". 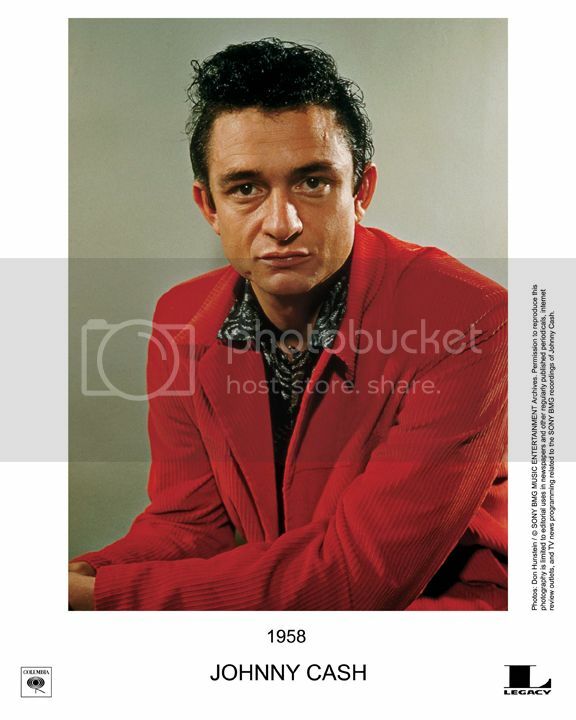 From 1969 to 1971, Cash starred in his own television show, The Johnny Cash Show, on the ABC network. In this prime-time show, Cash enjoyed booking contemporary performers as guests; Neil Young, Kenny Rogers and The First Edition (who appeared a record four times on his show), James Taylor, Ray Charles, Eric Clapton and Bob Dylan all appeared. In the 80’s Cash appeared in a number of television films including The Pride of Jesse Hallam and Murder in Coweta County. The singer, never taking himself to seriously also appeared as a "very special guest star" in an episode of the Muppet Show. His career was rejuvenated in the 1990s, leading to popularity with an audience not traditionally interested in country music. In 1993, he sang "The Wanderer" on U2's album Zooropa and later was offered a contract with producer Rick Rubin's American Recordings label, better known for rap and hard rock. Under Rubin's supervision, he recorded American Recordings (1994) in his living room, accompanied only by his Martin dreadnought guitar – one of many Cash played throughout his career. The album which featured covers of contemporary artists won Cash another Grammy. Health problems plagued Cash throughout the '90s and into the 2000s, but he continued to record with Rick Rubin; their fourth collaboration, American IV: The Man Comes Around, was released in late 2002. If you’ve never heard these albums, I strongly recommend you do. The choice of songs, the production and that voice of Johnny Cash is like nothing else. The following year, the Mark Romanek-directed video for his cover of Nine Inch Nails' "Hurt" garnered considerable acclaim and media attention, culminating in an unexpected nomination for video of the year at the MTV Video Music Awards. Everyone knew that Johnny wouldn’t be around for much longer and to see that video at the time was such a moving experience – as it remains today. Watching Cash sing “What have I become? My sweetest friend, everyone I know, goes away in the end”, brings you close to tears. He was one of country music's biggest stars of the '50s and '60s, In total, he wrote over 1,000 songs, scoring well over 100 hit singles. No other artist has touched the world of music quite like Johnny Cash. He is the only person to be inducted into the Country Music Hall Of Fame, The Rock And Roll Hall Of Fame AND The Songwriter's Hall Of Fame. The image of ‘The Man In Black’ is as deeply American as the stars and stripes themselves.